Usually one expects the radio emission from a GRB to rise slowly in flux, not peaking until several days post-burst before it slowly decays back into quiescence. This emission is known as the classical GRB afterglow and is believed to be produced by the forward shock created by the outward propagating material interacting with the surrounding interstellar medium. 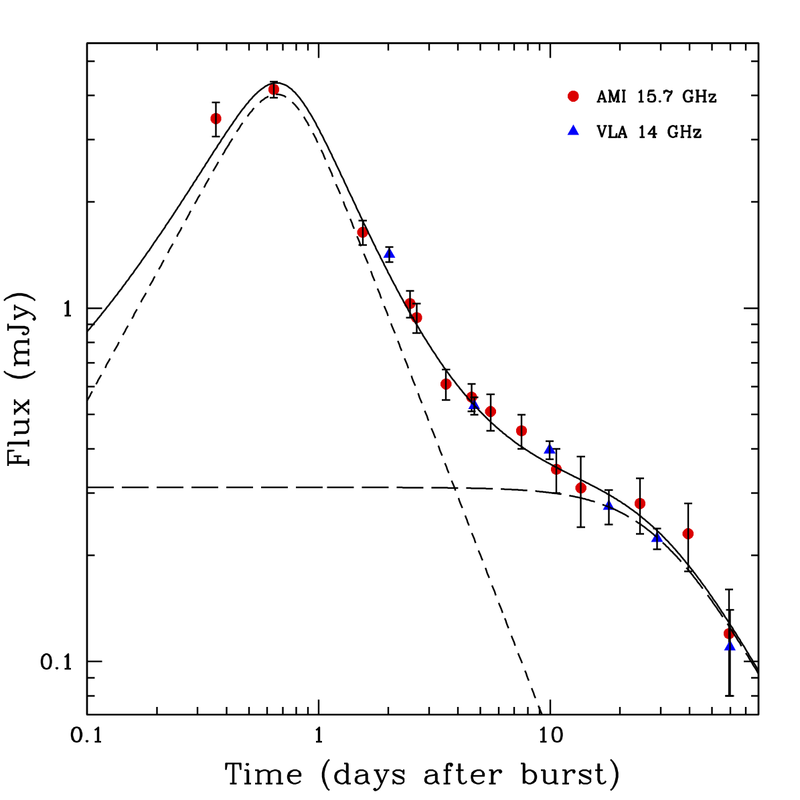 However, a bright radio flare within 1 day post-burst is also expected from the reverse shock, which is produced by material propagating back into the relativistic ejecta. Such a signature is very difficult to catch as it occurs very quickly requiring a radio telescope to be observing the GRB promptly following its explosion. Not only did AMI detect the forward shock emission from GRB 130427A, but saw it peak in brightness at 16 hours before it started to rapidly decline again. This is the first time that a peak in the reverse shock radio emission from a GRB has ever been observed. At later times the fading radio flux was dominated by the emission from the forward shock that we continued to monitor for 60 days. The figure above shows the light-curve of GRB 130427A obtained at 15 GHz with AMI. The dashed lines indicate the contribution that both the reverse and forward shock made to the overall radio flux that AMI observed. See the full publication on Astro-ph.